Why wait. Call us now. Every day is an opportunity for us to work hard, prove our experience, put safety first and maintain 100% client satisfaction. After all, we believe that is the only way to operate successfully in the oil and gas industry. Today, Killion Well Services is headquartered in Palestine, Texas, with a main production office in Canonsburg, Pennsylvania, and has grown to become a company with a respectable professional employee roster. 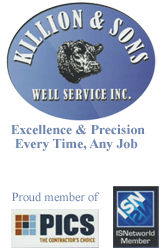 Killion Well Services provides a wide range of reliable well site and infrastructure support services to energy producers with the manpower, rentals, and equipment to keep our customers’ projects running smoothly and efficiently. We deliver innovative and efficient solutions for oil and gas operations through roustabout, production flow back services, and contract pumping. We pride ourselves in being a trusted partner that offers comprehensive approaches to achieve more efficient and safer results. At Killion Well Services, we look at things differently. We see every decision as an opportunity to do things better, more intelligently and more conscientiously. With the oil and gas industry changing more and more every day, we know leading the way is going to take extra effort to make those changes work effectively for our customers. With that being said, we know that being a leader comes with personal accountability. That’s why we go above and beyond to demonstrate our commitment to our customers, ensure the safety of our employees and protect our environment and communities with the highest degree of integrity and enthusiasm.